Orthopaedic & Spine Center in Newport News, Virginia, now offers the latest technology for partial knee resurfacing and total hip replacement to our patients who are candidates for these surgeries. 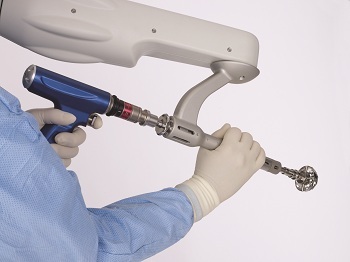 Makoplasty® surgical procedures, using the RIO® Robotic Arm Interactive Orthopedic System, allows orthopaedic surgeons to pre-surgically plan an implant surgery. Based on a CT scan of the patient’s anatomy, a 3-D anatomic reconstruction is created, which allows the orthopaedic surgeon to precisely position knee or hip implants. Better alignment and positioning of joint replacement components has long been the “Holy Grail” of Orthopaedic Surgery. Using MAKOplasty, surgeons now have more resources and tools than ever before to make that a reality. Boyd W. Haynes III, M.D. and Mark W. McFarland, D.O. are the OSC Orthopaedic Surgeons performing MAKOplasty® Robotic-Arm Assisted Total Hip and Partial Knee Replacement at Bon Secours Mary Immaculate Hospital in Newport News, VA. To read our patient success stories, click here. MAKOplasty surgery is not for every patient who needs a hip or a knee replacement. Knee resurfacing is only an option if you have uni-compartmental or bi-compartmental arthritis of the knee, meaning only one or two areas of the knee are affected. If you need a total knee replacement, MAKOplasty would not be an option for you at this time. Some patients who need total hip replacement may not meet all criteria for MAKOplasty. Again, it is important that you consult with a MAKOplasty-trained Orthopaedic Surgeon to determine if MAKOplasty is the right option for you. To learn if you are a candidate, contact OSC at 757-596-1900 to make an appointment with either Dr. Haynes or Dr. McFarland.